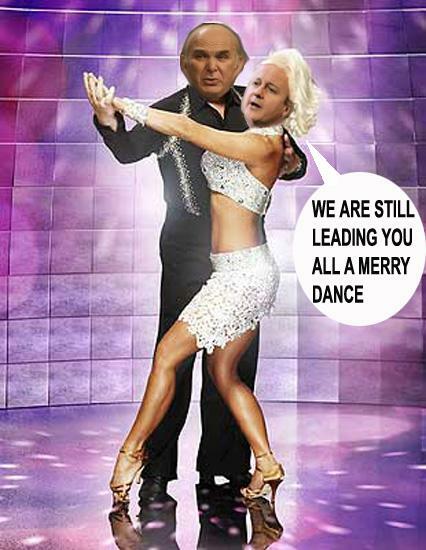 Following the surprising news that Business Secretary Vince Cable is to appear on the Christmas special edition of the hit BBC reality show Strictly Come Dancing, we can exclusively reveal that he is not the only government minister to try his luck at TV. We have received a copy of a Top Secret memo sent by the Prime Minister, ordering several senior government figures to “boost the image of the coalition by going on popular television programmes”. Mr. Cameron explains in the memo that he “expects the government to become rather unpopular once the consequences of the recent public spending cuts hit home. However, if we can show that the very government figures responsible for this are popping up on the box and showing the right mix of humility and acceptable zaniness to the watching public then chances are, we’re home and dry. You know like that David Gest did the other year in that jungle thing with the koala’s knobs and stuff. And get this Georgie Boy, if we somehow manage to win a few quid we can say we’re doing our bit to pay-off the deficit. George Osborne will show up on ITV’s “Family Fortunes”. And Danny Alexander will be appearing in BBC2 daytime quiz “Pointless”.